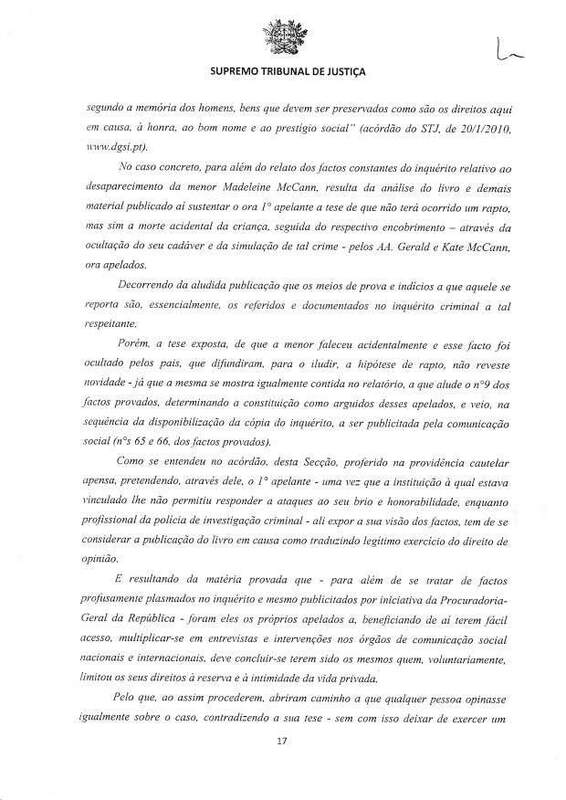 Kate, Gerald, Madeleine, Sean and Amelie McCann ― the last three minors represented by the first claimants, their parents ― filed, against Gonçalo Amaral, the publisher G&P 1, the audiovisual company VCFA 2 and TVI 3, legal actions in the ordinary form, subsequently attached to Lisbon 1st Civil Chamber, demanding the condemnation of the first defendant to pay the claimants the total amount of €1.200.000, plus interest at the legal rate since the summons, as compensation for moral damages arising from the publication by the first defendant, in book and DVD, of his version of the facts related to the disappearance of the minor MMC, third claimant, and the prohibition for sale, publication or disclosure by all defendants, book and DVD in question. 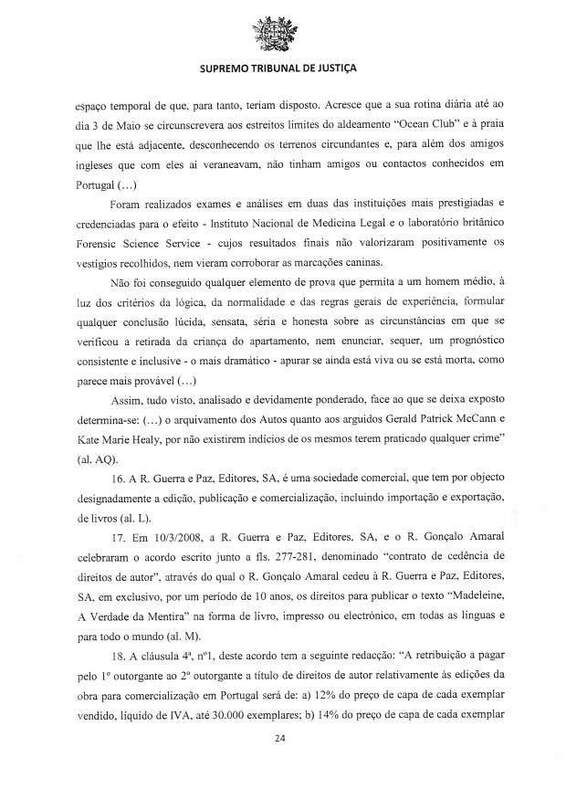 The first instance's judgement concluded that the book written by Gonçalo Amaral, the adaptation of this book for a documentary and the interview of the same defendant were illicit, according to article 484° of the CC 4 and that were verified the other assumptions legally binding the compensation foreseen in CC's art. 483°, wherefore the requests expressed in the lawsuit were considered partly proceeding in the terms mentioned above. 1 : Guerra & Paz, Editores SA. 3 : TVI-Televisão Independente . 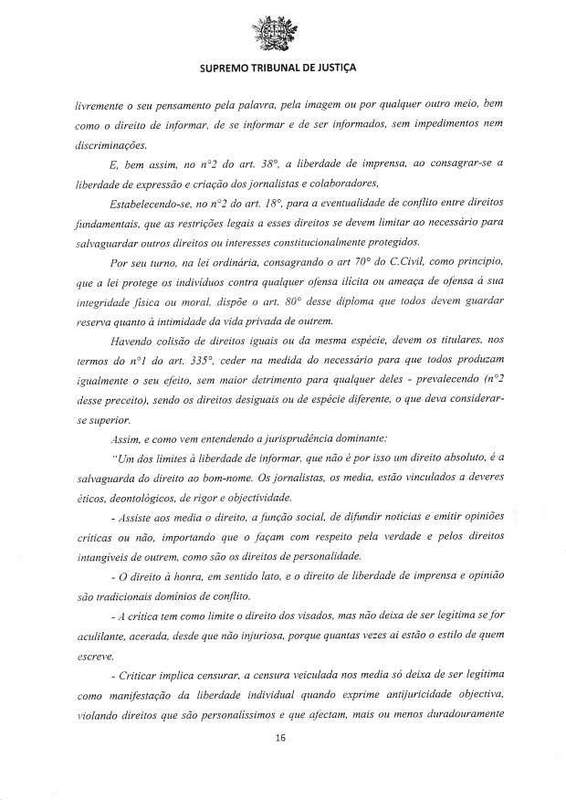 4 : The Portuguese Civil Code will be mentioned as CC. 5.There are evidence of negligence in the guard and safety of the children (n° 24)." The interview given by Gonçalo Amaral to the newspaper CdM 1 and published in the edition of July 24, 2008 is a way to advertise the book and therefore the thesis developed in it. 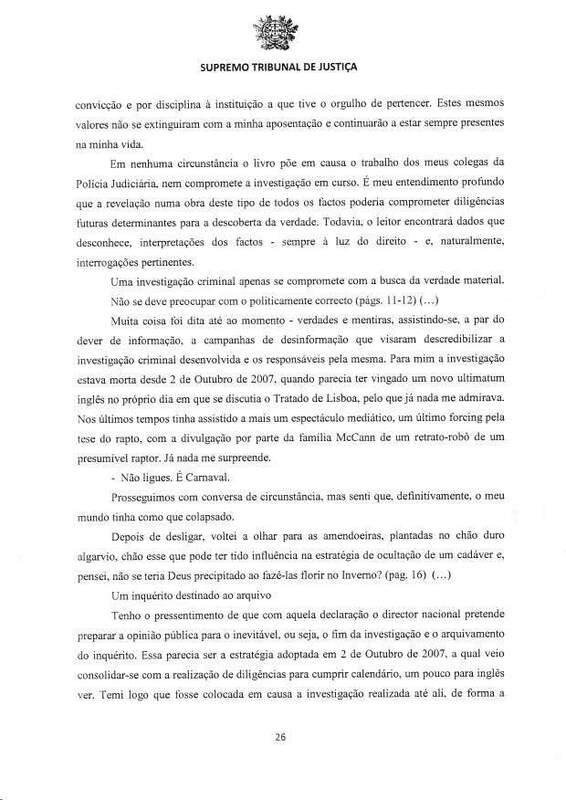 Here the defendant reaffirms that thesis in so many answers as questions put to him : 1° the girl died in the apartment 2° the testimonies of Jane Tanner and Kate McCann are not credible 3° there are clues of crime simulation 4° there was concealment of the body (n° 48). 1 : The daily newspaper Correio da Manhã is from now on named “CdM”. The documentary develops the referred opinion in a more appealing way, as it is proper to the audiovisual support, giving it an appearance of police reconstruction of the facts. It steps from the expression of an opinion to the attempt to prove a thesis. 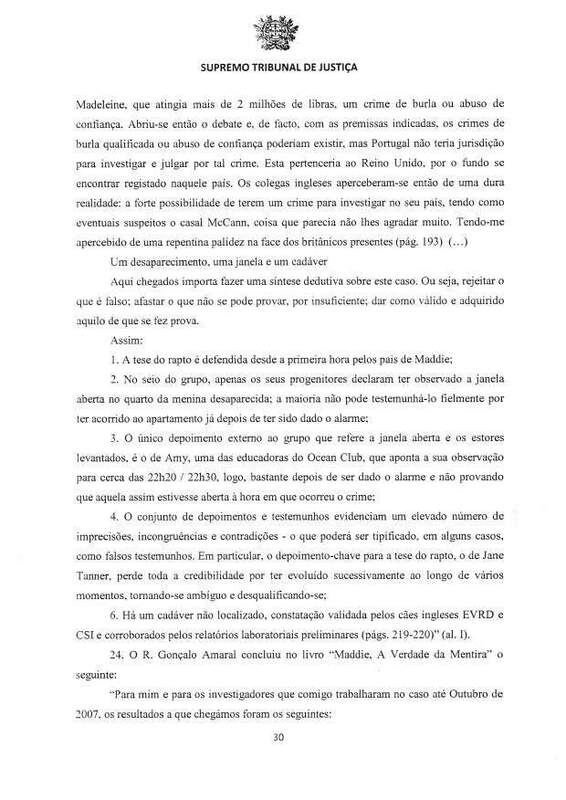 It is the defendant Gonçalo Amaral who says it, while the narrator at the beginning of the program : "In the next 50 minutes I will prove that the child was not abducted and died in the holiday apartment in Praia da Luz" (n° 41). In the documentary, this thesis is clearly stated as the contra-narrative of the abduction hypothesis, as the real alternative to it and to the shelving of the investigation for lack of evidence. This is why the challenge is "discover the truth about what happened that day. 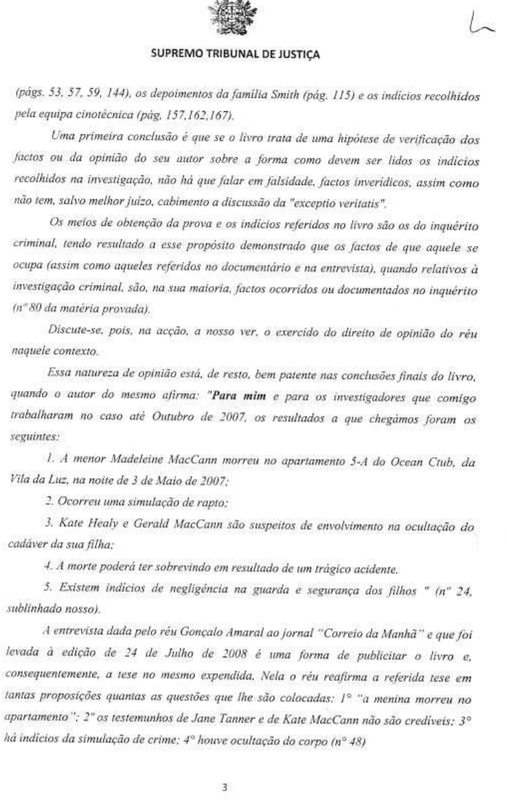 A death that many people want to cover up", ending the defendant with this conclusion : "I am sure that this fact [Madeleine McCann died in the apartment] on day will be revealed. The investigation was brutally interrupted and there was a political and precipitated shelving. Some hide the truth, but later or earlier, the varnish will crack and the revelations will emerge. Only then there will be justice for Madeleine McCann" (n°s 41 and 42). It is that, it appears , the meaning that the average reader attributes to the title "Maddie - the Truth of the Lie", the "truth" being the thesis of the book and the "lie" the abduction narrative. 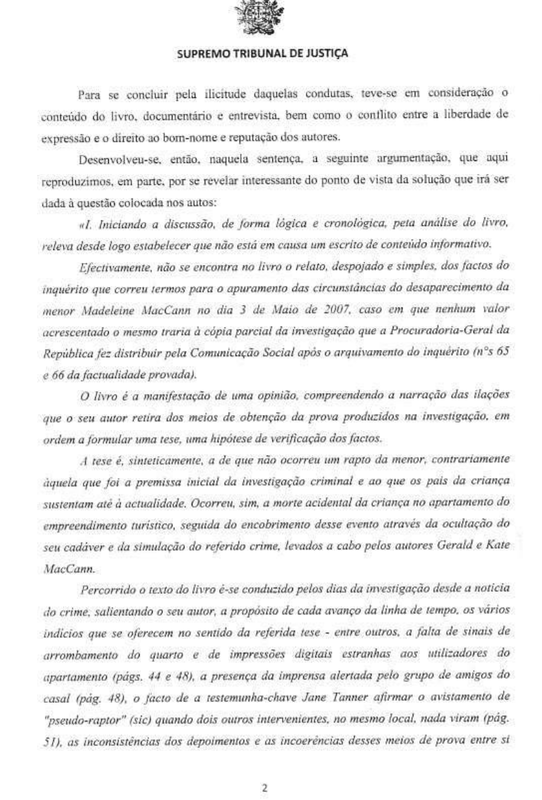 This theory of the facts comes from the own investigation, it is shaped in the chief inspector Tavares de Almeida's report (n° 9), it was an avenue pursued by the investigation (n°s 10 and 11), it determined the constitution of the claimants Gerald and Kate McCann as "arguidos" and was put within the reach of the media, and soon of the general public through a copy of the inquest (n°s 65 and 66). The defendant is not referred to the investigation as a mere commentator of a criminal "fait-divers", a writer of police intrigues or a criminologist. Considering the matter in question here and what obviously contributes to the authority and credibility of his opinion, the defendant was the coordinator of the criminal investigation into the disappearance of Madeleine McCann from the day of the event up to October 2, 2007. It is this particular aspect conjugated with others that are appurtenances - as is the time coincidence between the shelving of the investigation on the one hand, and the launch of the book, the interview and the selling of the book on the other – that are part of the discussion on how to solve, in this case, the conflict between the right of the defendant and the rights of the claimants. The legal protection of such rights of the claimants is based on the Universal Declaration of Human Rights (UDHR 1), of which the article 12° states that no one will suffer, among others, attacks upon one's honour and reputation, stipulating that against such attacks anyone is entitled to the protection of the law. 1 : The Universal Declaration of Human Rights (1948) will be alluded to as UDHR. Also from the European Convention for the Protection of Human Rights and Fundamental Freedoms 1 results the protection of both rights. "Everyone has the right to freedom of expression. This right shall include freedom to hold opinions and to receive and impart information and ideas without interference by public authority and regardless of frontiers. This article shall not prevent States from requiring the licensing of broadcasting, television or cinema enterprises". "the exercise of these freedoms, since it carries with it duties and responsibilities, may be subject to such formalities, conditions, restrictions or penalties as are prescribed by law and are necessary in a democratic society, in the interests of national security, territorial integrity or public safety, for the prevention of disorder or crime, for the protection of health or morals, for the protection of the reputation or rights of others, for preventing the disclosure of information received in confidence, or for maintaining the authority and impartiality of the judiciary." "everyone charged with a criminal offence shall be presumed innocent until proved guilty according to law". As it will appear below, the activity of the European Court of Human Rights in interpreting and precipitating in the concrete case of those standards reveals to be particularly important [retain up yet the principle of the reception of the international law into Portuguese law, in art. 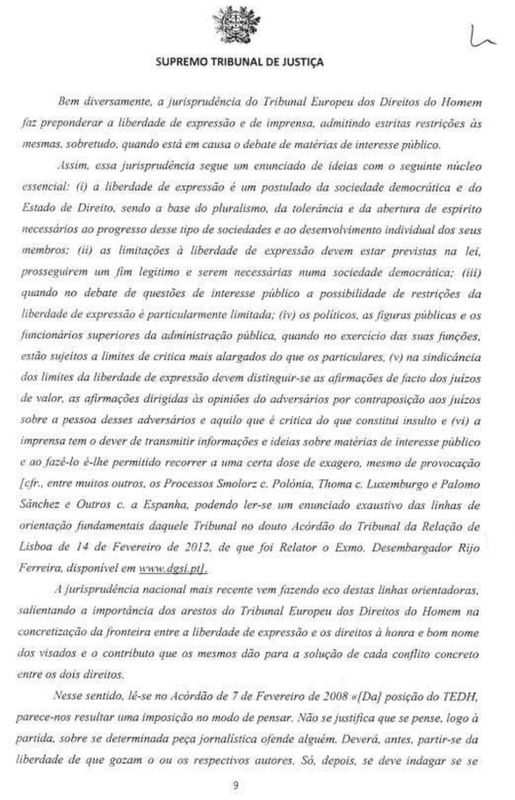 8°-1 of the Constitution of the Portuguese Republic (CRP) 3]. The CRP protects the rights analysed in the chapter on rights, freedoms and personal guarantees, which is the part of fundamental rights. 1 : The European Convention for the Protection of Human Rights and Fundamental Freedoms is currently shortened in the Convention or the European Convention on Human Rights, hence ECHR. 2 : In order to avoid any possible confusion, in English, between European Court of Human Rights (ECHR) and European Convention on Human Rights (as well ECHR), the first will be alluded to as ECHR, while the second from now on will be named by its shortened forms (see above). 3 : The Constitution of the Portuguese Republic will be mentioned as CRP. 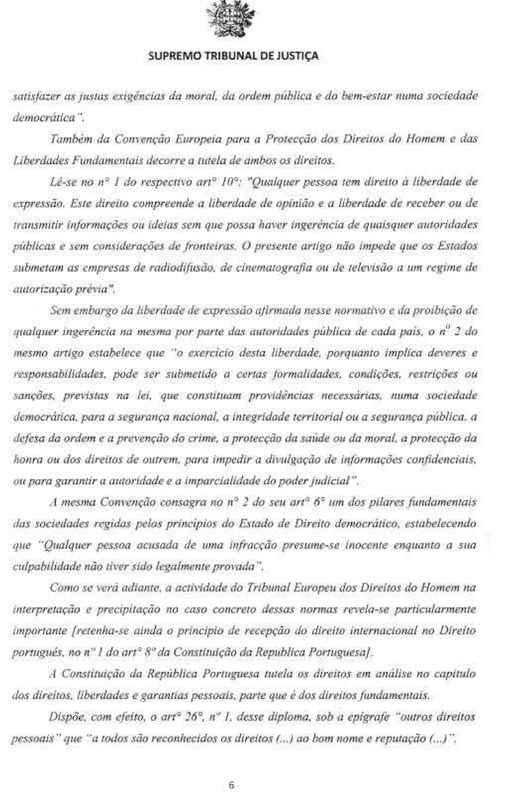 In spite of the value of this fundamental freedom, the paragraph 3 of the same article refers to offences committed in the exercise of this freedom by handing them over to the area of the general principles of criminal law and of the unlawful regarding simple social order, while paragraph 4 points clearly to the limits which the same freedom may be subject to, recognizing "to all persons, private or collective ( ... ) under conditions of equality and effectiveness , the right to reply and rectify as well as the right to be compensated for damages suffered." "From n°3 results, however, that there are certain limits to the exercise of the right to freely express and divulge one's thoughts. The freedom of expression and information can not actually take precedence over the fundamental rights of citizens to good name and reputation, to moral integrity, to privacy" (CRP). In the Constitution and also interesting for the present case, the freedom of the press is also protected, being one of its greatest exponents "the freedom of expression and creativity for journalists and collaborators" [art. 38°-2a)]. Under the aegis of ordinary law, the article 70° of the CC establishes the general protection of the personality, stating that the law protects individuals against any illegal offence or threat of offence to their physical or moral integrity. 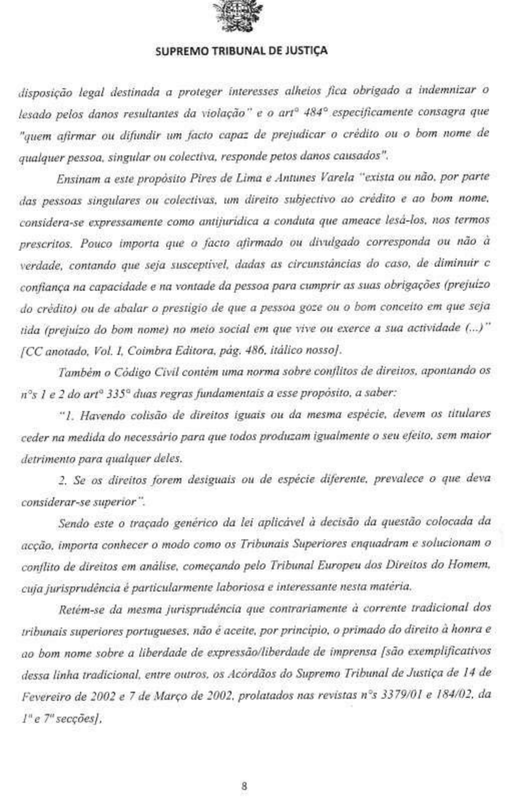 In this regard Pires de Lima and Antunes Varela teach that "whether, by natural or legal persons, a subjective right to credit and good name exists or not, a conduct threatening to cause them harm, in the prescribed terms, is considered as expressly anti-juridical. Never mind that the stated or disclosed fact corresponds to the truth or not, as long as it likely can, given the circumstances of the case, reduce the confidence in the ability and willingness of the person to fulfill their obligations (loss of credit) or shake the prestige that the person enjoys or the good image the person has (loss of good name) in the social environment in which the person lives or carries on their business"[annotated CC, Vol . I, Coimbra Editora, p. 486]. 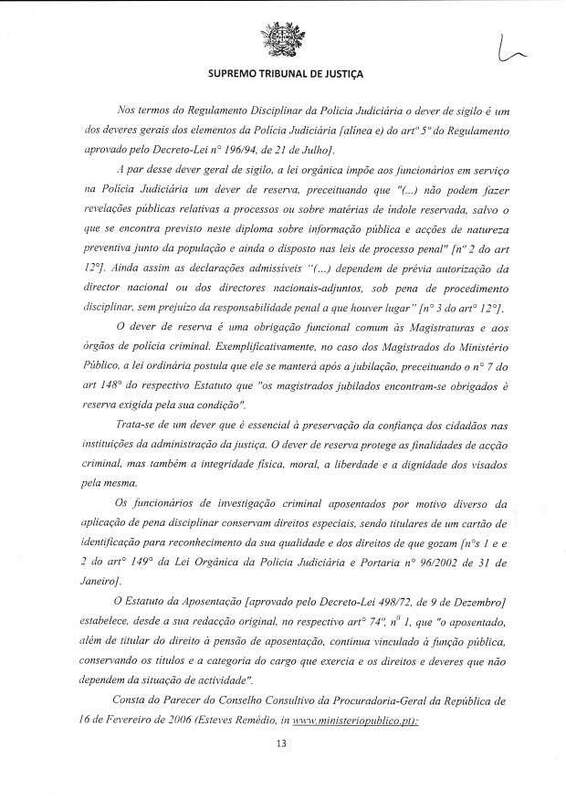 From this same jurisprudence one retains that in contrast to the traditional current of the Portuguese higher courts, this court does not accept, in principle, the priority of the right to honour and good over the freedom of expression/freedom of the press [are examples of this traditional line, among others, the STJ's Rulings of February 14 2002 and March 7 2002 reported in reviews n° 3379/01 and 184/02, of the 1st and 7th sections]. Very differently, according to the case-law of the ECHR, freedom of speech and press prevails, admitting strict restrictions, especially when is at stake the debate of matters of public interest. Thus, this jurisprudence follows an enunciation of ideas with the following essential core: (i) freedom of expression is a postulate of a democratic society and of a State of law, being the basis of pluralism, tolerance and open-mindedness necessary to progress in this kind of societies and to the individual development of its members, (ii) the limitations to freedom of expression must be anticipated by law, pursue a legitimate aim and be necessary in a democratic society, (iii) in debates of matters of public interest the possibility of restrictions on freedom of expression is particularly limited, (iv) the politicians, public figures and senior officials of public administration, when exercising their functions, are subject to wider limits of critic than individuals, (v) considering the limits of freedom of expression, one should distinguish between factual assertions and value judgements, between statements addressed to the opinions of the opponents as opposed to judgements 'ad hominem' and between what is critic and what is insult and (vi) the press has the duty to impart information and ideas on matters of public interest and in doing so is allowed to a certain amount of exaggeration, even of provocation [cf., among many others, Smolorz vs Poland, Thoma vs Luxembourg and Palomo Sanchez and Others vs Spain ; an exhaustive enunciation of the fundamental guidelines of that learned Court of Justice can be read in a Judgement of the Appeal Court of Lisbon of February 14 2012, rapporteur Hon. Judge Rijo Ferreira, available at www.dgsi.pt]. The most recent national jurisprudence is echoing these guidelines, stressing the importance of the decisions of the ECHR in implementing the boundary between freedom of expression and the rights to honour and good name of the concerned persons and the contribution of those decisions in resolving each particular conflict between the two rights. This does not mean, however - in our view - that the cases in which such a restrictive interference is justified are not intensely relevant. It is enough to read article 10°-2 to weight what it contains in terms of essential values for human beings" [Review n°4403/07 of 2nd Section. In the same sense, can be read the Ruling of March 12 2009 in the Review n° 2972/08]. "The honour of the person translates therefore into the positive value that they infer themselves from the core of their being, that is the moral and ethic substrate of their existence, while the social consideration, the good name and the reputation translate into the judgement by others about every one. Correspondingly, the right to good name and to reputation is essentially for the person not be offended or injured in their honour, dignity or social consideration by imputation of others and to fight back against this offence and to obtain redress" [idem]. "honour covers immediately the projection of the value of human dignity, which is innate, offered by nature equally to all human beings, unlikely to be lost by any man in any circumstance ( ... ). In a broad sense, it also includes the good name and reputation, as syntheses of social appreciation for determining qualities of uniqueness of each individual at the intellectual, moral, sexual, family, professional or political level" ["The Personality General Law", 1995, p. 303] . "the qualities acquired throughout life, by the individual's effort or otherwise and in various aspects (family, political, professional, scientific, literary, artistic, commercial, etc.). It covers inter alia, character, honesty, righteousness, loyalty, etc., corresponding to a sense of personal self-esteem. It is based on individual awareness of one's own worth : self-recognition and self-assessment". ..."the law protects, however, not only that personal feeling of own worth, which can call up the internal honour, but above the projection in the social consciousness of all the personal values of each individual, which can be called external honour : the qualities a person needs to be respected in a social environment, including the good name and the reputation, the social consideration" [op. cit. p. 587] . "It has not been possible to obtain any piece of evidence that would allow for a average man, under the light of the criteria of logics, of normality and of the general rules of experience, to formulate any lucid, sensate, serious and honest conclusion about the circumstances under which the child was removed from the apartment (whether dead or alive, whether killed in a neglectful homicide or an intended homicide, whether the victim of a targeted abduction or an opportunistic abduction), nor even to produce a consistent prognosis about her destiny and inclusively - the most dramatic - to establish whether she is still alive or if she is dead, as seems more likely. 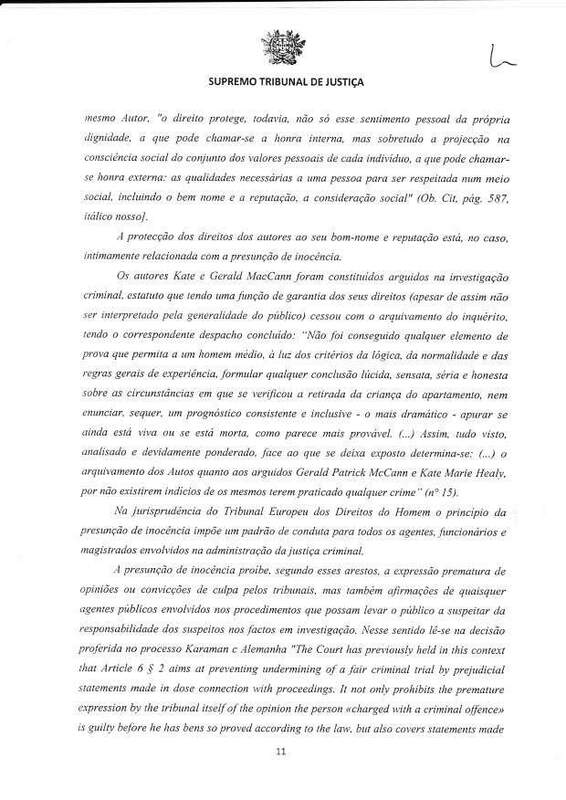 (…) Therefore, after everything seen, analysed and duly pondered, facing all that is left exposed, we settle (…) the archiving of the process concerning the "arguidos" Gerald Patrick McCann and Kate Marie Healy, because there are no indications of their practise of any crime" (n° 15). … made by other public officials about pending criminal investigations which encourage the public to believe the suspect guilty and prejudge an assessment of the facts by the competent judicial authority [HUDOC 1]. 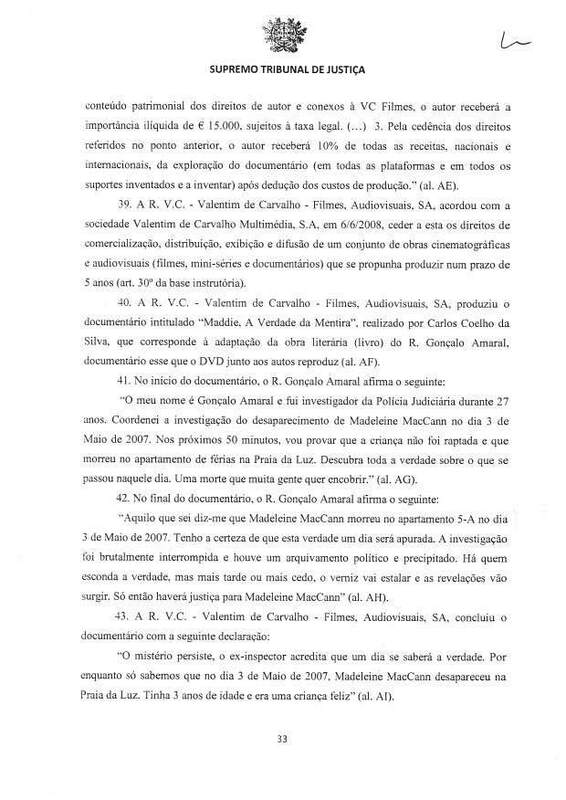 On July 1 2008, GA retired from the Judicial Police, having the book "Maddie - A Verdade da Mentira" been released on the 24th and sold with the same day edition of the newspaper CdM, an edition where was published the interview which is part of this lawsuit (n°s 13, 25, 26 and 48). "The Police have the responsibility of defending democratic legality, insuring internal security and protecting the citizens' rights" [art. 272° of the CRP]. "The Judicial Police is an upper organ of the criminal police assisting the administration of justice, hierarchically organised, dependent on the Minister of Justice and supervised by law [article 1° of the Organic Law of the Judicial Police, approved by Decree-Law n° 275- A/2000 of November 9, as amended by Decree-Law No. 235/2005, of December 30, then in force]. 1 : The HUDOC database provides access to the case-law of the Court, the European Commission of Human Rights' decisions and reports and the Committee of Ministers' resolutions. Under the Disciplinary Regulation of the Judicial Police, the duty of confidentiality is one of the general duties of the members of the Judicial Police [cf. art. 5°-e of the Regulation approved by Decree-Law No. 196/94, of July 21]. 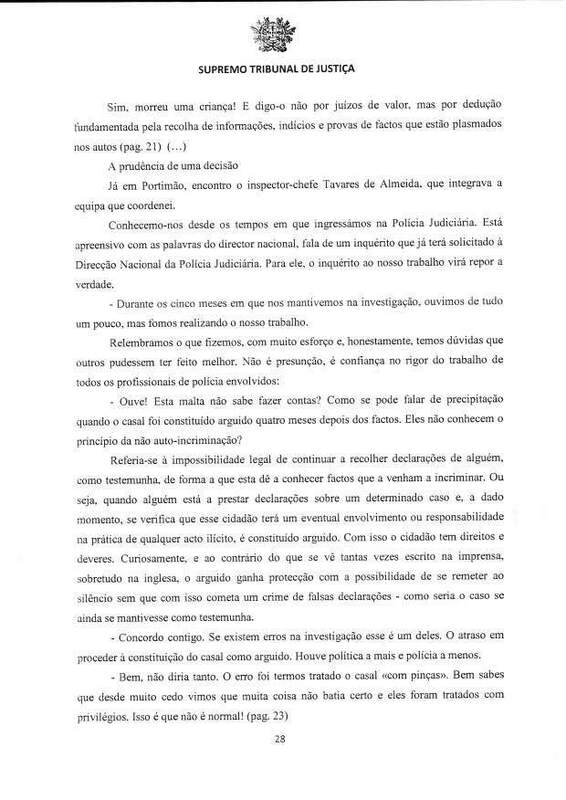 Alongside this general duty of confidentiality, the Organic Law of the Judicial Police requires from the civil servants working in the Judicial Police a duty of reserve, prescribing that (...) "they cannot make public disclosures related to lawsuits or matter of reserved nature other than what is provided for in this law on public information and preventive actions among the population, and also in the provisions of the criminal procedure law" [art. 12°-2]. Even so the statements, when admissible, (…) "are subjects to prior authorisation provided by the national director or the national deputy directors, at risk of disciplinary proceedings, maintaining the eventual criminal liability" [art. 12°-3]. The duty of reserve is a functional requirement common to magistrates and organs of criminal police. As an example, in the case of the magistrates of the Public Ministry, the ordinary law postulates that this duty will remain after retirement, establishing the article 148°-7 of the Statute that "retired judges must respect the reserve required by their condition." In disagreement with this judgement, the defendants 1°, 2° and 3° (the defendent TVI didn't) lodged an appeal against it. Article 18-2 establishes, in the event of a conflict between fundamental rights, that legal restrictions on these rights are limited to the need of preserving other constitutionally protected rights or interests. In the case before us, besides the reporting of the facts that are part of the investigation into the disappearance of the minor Madeleine McCann, the analysis of the book and other published matter shows that the now first appellant sustains the thesis that there was no kidnapping, but accidental death of the child, followed by a cover-up - concealment of the body and kidnapping simulation – by the applicants Gerald and Kate McCann, now the respondent party. 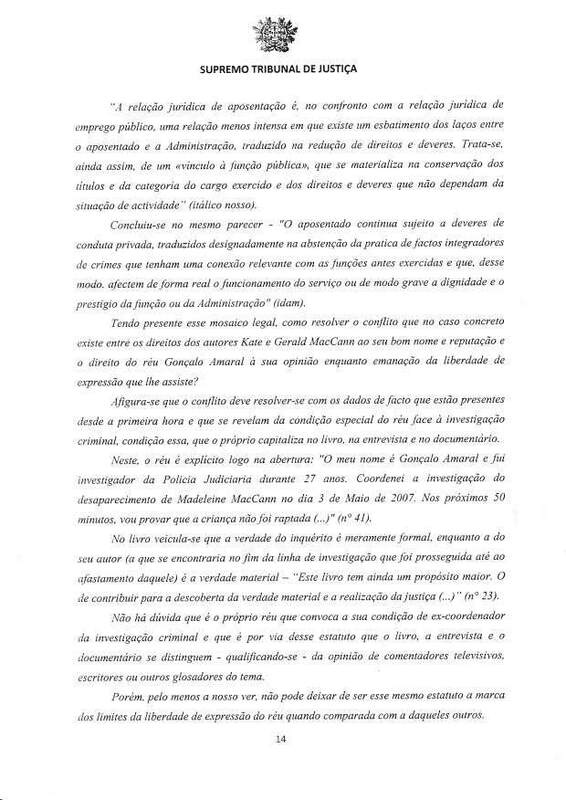 Moreover, we do not see how the right of the respondents to enjoy, after their constitution as "arguidos", the guarantees of a criminal trial – including the right to a fair investigation and the right to liberty and security - could be affected by the content of a book that essentially describes and interprets facts that are part of an investigation the contents of which have been made public. Both then respondents (here appellants) lodged an appeal for reviewing the Appeal Court sentence. 1. The applicants Gerald McCann and Kate Healy are married to each other. 3. The applicant Sean McCann was born on 1/2/2005, son of Kate McCann and Gerald McCann . 5. 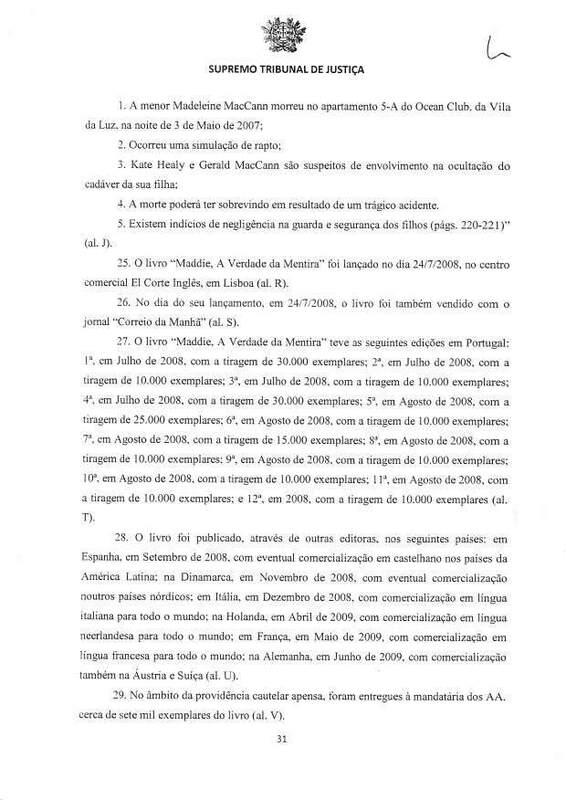 The applicant Madeleine McCann has been missing since 3/5/2007, resulting in the criminal investigation n°201/07.0 GALGS, opened by the prosecutor of Portimão. 1 : These proven facts were established where the five members of the McCann family were claimants. 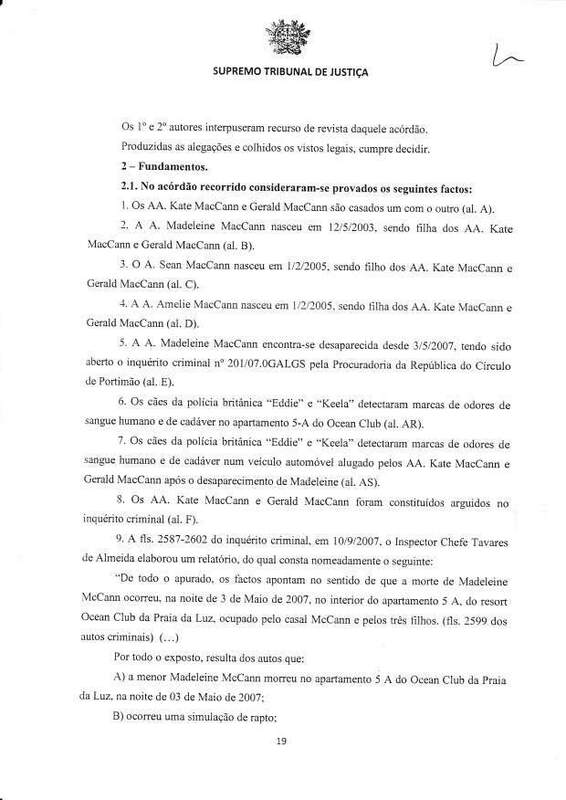 In the concluding sentence the requests of the three McCann children were dismissed. Their parents could have lodged an appeal on their behalf, but they chose not to. Hence in the judgement by the Appeal Court Kate and Gerald McCann were the only respondents. H) Evaluating the adequate measure of constraint to be applied in the case (folio 2601 of the minutes)". "Since the investigation, in these autos, concerns the practice of kidnapping, homicide, exposure or abandonment and concealment of corpse, the first three crimes being punished with a sentence of more than 3 years imprisonment, and since it seems convenient to identify the person who exhibited suspicious behaviour in the vicinity of the place where the child disappeared from, as mentioned in statements of folios 3150, 3154 and sq, the data requested by the public prosecutor being thus very important to discover the truth, I order (...) the soliciting telecommunications operator Portugal Telecom." 12. 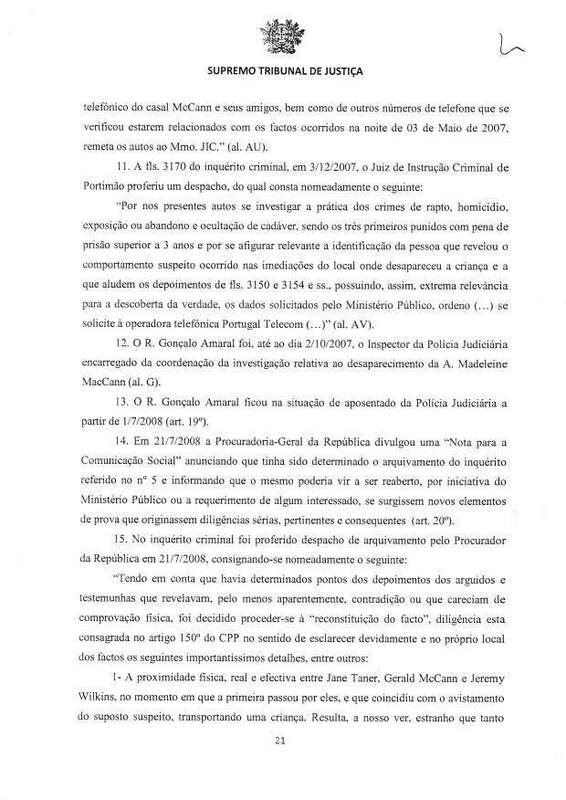 The defendant Gonçalo Amaral was, until 2/10/2007, the PJ inspector in charge of coordinating the investigation into the disappearance of the applicant Madeleine MC. 14. 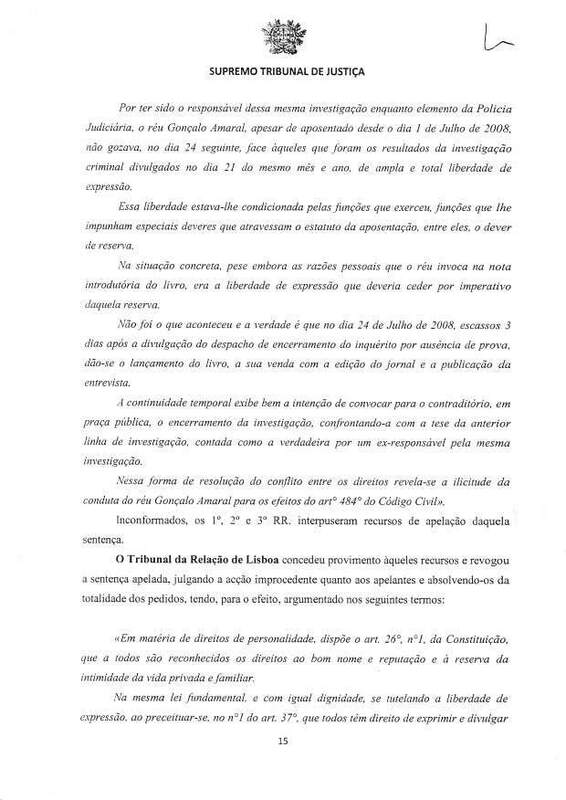 On 21/7/2008, the Republic General Prosecutor informed through a "note for the social communication" that the investigation mentioned in 5. would be shelved and could be reopened at the instigation of the Public Ministry or at the request of any interested party, if new evidence arose, bringing forth serious, relevant and consistent inquiries (n° 20). 1 : The penal process is divided in 3 phases, the first, mandatory, being the criminal investigation. It is taken in charge by various police forces, directed by the Public Ministry, the PM itself being under the control of a criminal inquiry judge. The second phase is the criminal inquiry. It is not mandatory and has to be requested either by the arguido(s), by the assistant(s) of the process or by a senior magistrate, but never by the Public Ministry. This phase, a kind of recourse against the criminal investigation, is orchestrated by the criminal inquiry judge and culminates in a crucial contradictory debate. 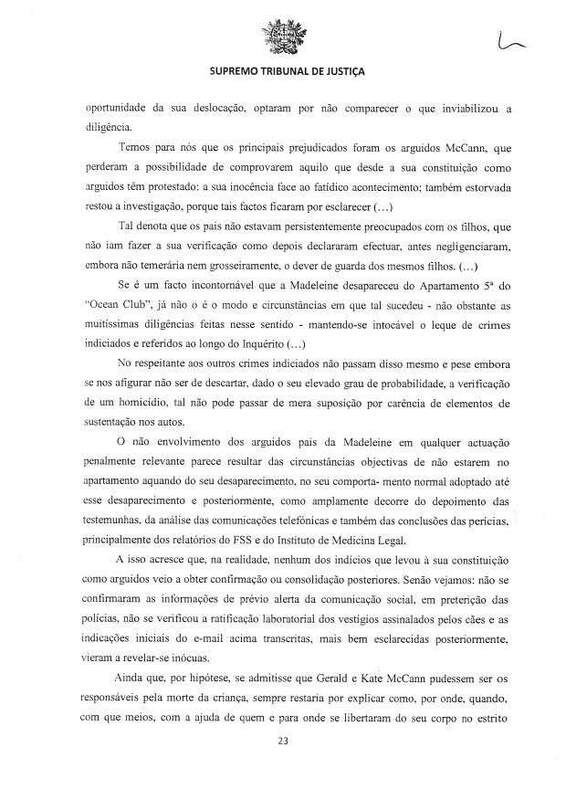 Neither the McCann couple nor the "hierarchy" requested the criminal inquiry phase, a manner of agreeing with the conclusions of the criminal investigation. The last phase is eventually the judgement. 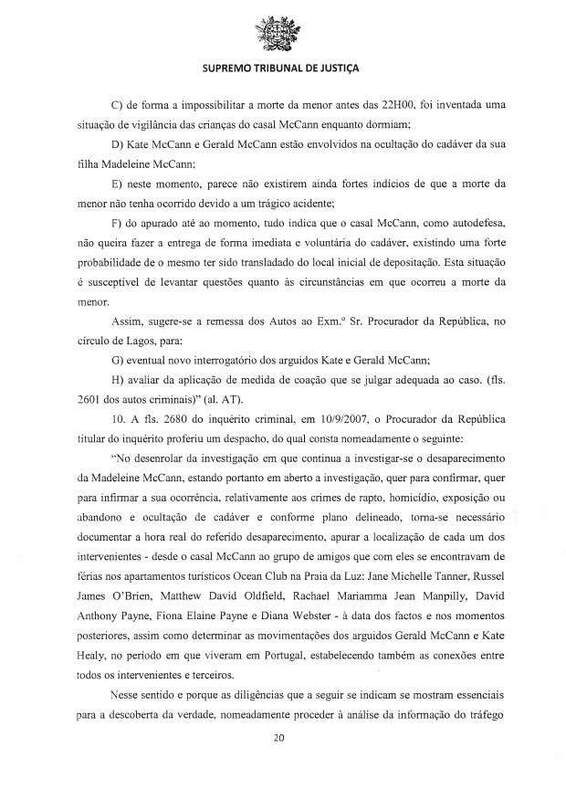 We believe that the main damage was caused to the McCann, who lost the possibility to prove what they have protested since they were constituted "arguidos" 1 : their innocence in relation to the fateful event. The investigation was also disturbed, because said facts remained without clarification (...). Concerning the other surmised crimes 3, they are no more than that and in spite of our perception that, due to its high degree of probability, the occurrence of a homicide cannot be discarded, such cannot be more than a mere supposition, due to the lack of supporting elements in the files. To this should be added that in fact none of the clues that led to their constitution as "arguidos" was later confirmed or consolidated. Let's judge it: the information concerning a previous alert of the media before the police was not confirmed, the residues that were marked by the dogs were not corroborated in laboratory, and the initial indications from the above transcribed email 4, better examined afterwards, that ended up appearing to be inconclusive. 1 : An "arguido" is a formal suspect, against whom certain supported elements exist, but who is endowed with the presumption of innocence, a principal that here is fully realised. This statute is attributed, in order to establish the material truth, on suggestion of the police by the Public Ministry which assumes the responsability of doing do. The arguido(a) has, it is mandatory, to be assisted by a lawyer. In French an arguido is a "témoin assisté". 2 : The fact that, according to Pamela F, a child, possibly Madeleine McCann, had cried during more than an hour on May 1. 3 : "Crimes that aren't associated to neglect". 4 : The email on the preliminary DNA analysis by the FSS of the samples collected in the car hired by the MCs. Therefore, everything having been examined, analysed and duly pondered, considering what is left exposed, we determined the archiving of the autos concerning the (by lawyer) assisted witnesses Gerald Patrick McCann and Kate Marie Healy, due to the lack of clues of their practising any crime". 16. The defendant G&P is a commercial company whose objective is namely editing, publishing and trading books, import and export included. 17. 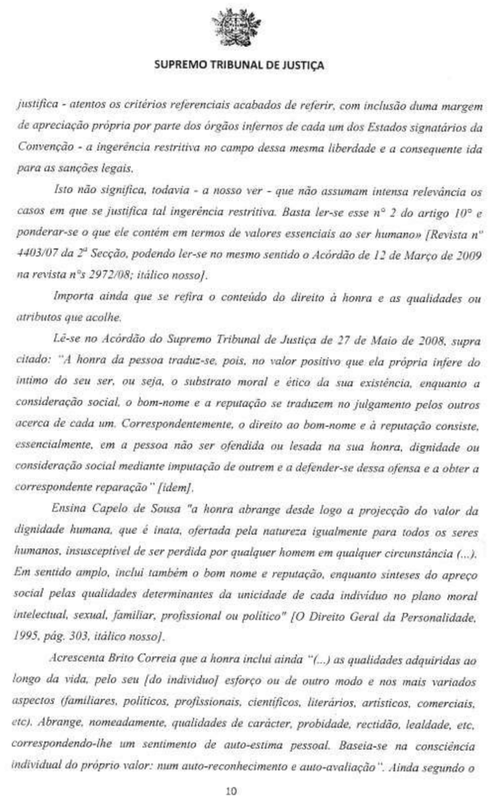 On 10/03/2008, defendants G&P and Gonçalo Amaral celebrated a written agreement (attached at pp. 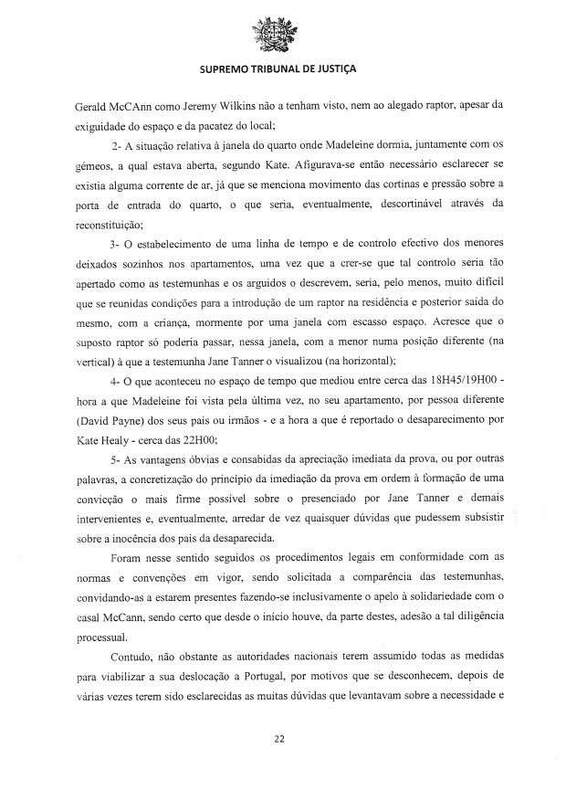 277-281), referred to as "copyright transfer contract", in terms of which the defendant GA yields to defendant G&P for a period of ten years, the exclusivity of copyrights of the book Maddie - a Verdade da Mentira in printed or electronic form, in any language ​​and in the whole world. 20. 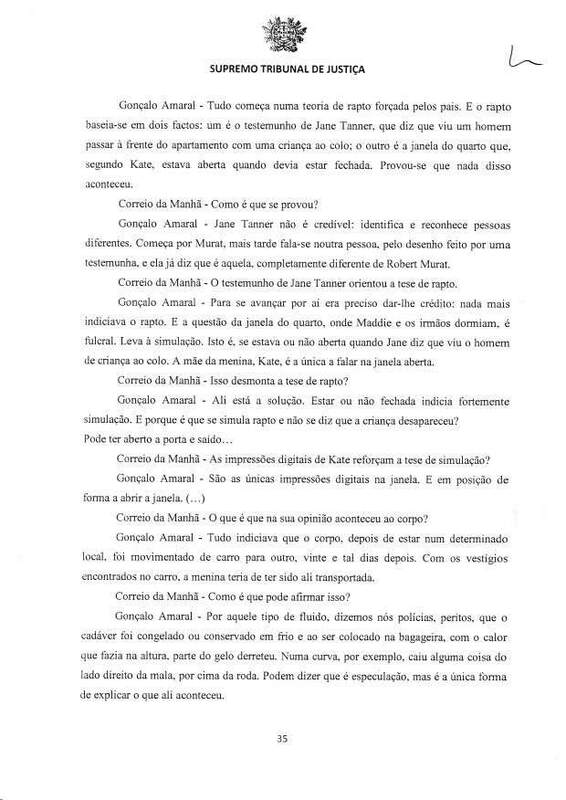 The defendant Gonçalo Amaral is the author of the book Maddie - A Verdade da Mentira, published by the defendant G&P. 21. On the cover of the book stands, in red, the word "confidential" and on the 4th cover it reads "Reserved read" and "contains unique revelations". 22. The data sheet of the book (p. 4) says namely this : "Review: Fernanda Abreu. Cover and pagination : Ilidio J.B. Vasco. Photography author : Sandra Sousa Santos © G&P 2008. All rights reserved. © Cofina media for photographs and infoengraving, developed by Nuno Costa." ... conviction and discipline regarding the institution to which I was proud to belong. My retirement will not extinguish these values, they'll go on being present in my life. The constitution of Kate Healy and Gerald McCann, Madeleine's parents, as "arguidos" should have marked a turnaround in the relationship among the police forces and the couple. 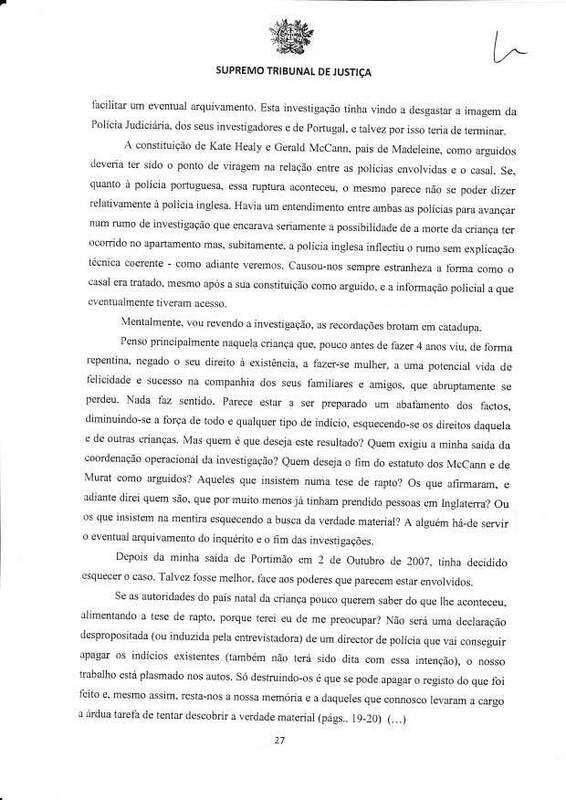 If, on the Portuguese police side, the break occurred, it seems that the same cannot be said of the English police. There was an agreement between the two police forces to move forward in an investigation that was seriously considering the possibility that the child died in the apartment, but suddenly the English police veered without consistent technical explanation - as we shall see further. We have always found it odd the way the couple were treated, even after they got their arguido status, and their eventual access to police information. – Look ! These people 1, do they know how to sum things up ? How can one speak of precipitation when the McCann became assisted witnesses four months after the facts ? Do not they know the principle of non-self-incrimination ? 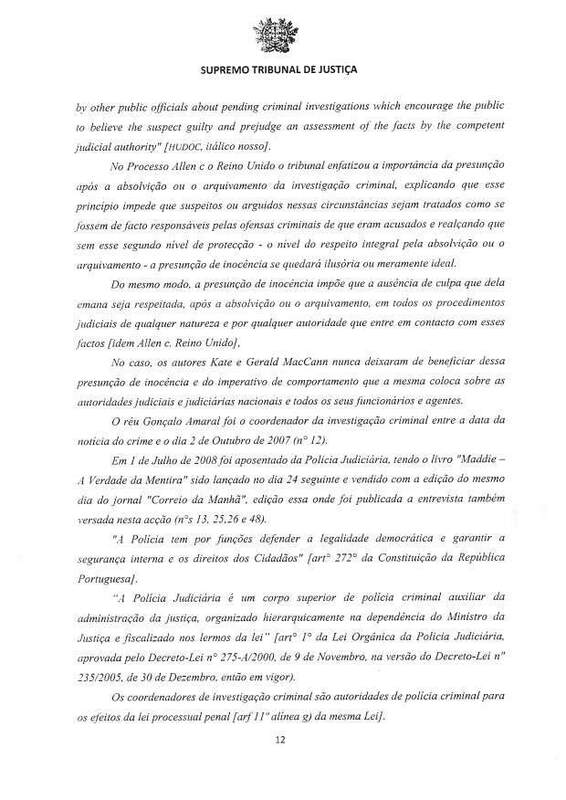 1 : One could imagine that GA is referring to the unfortunate words (the British police was following the MC instead of maintaining a critical distance) that motivated, matter of diplomacy, his dismissal of the case by the national director of the PJ, Alípio Ribeiro, but no, he evokes the suggestion of a precipitate 'arguido' status made by the latter to the journalist of the daily Público on 02/02/2008, i.e 4 months later. – They stayed in the Algarve as long as the abduction thesis was talked about... When this thesis was questioned, they immediately started talking about returning to England. – You know, there are British journalists who believed that Portugal was a country of the third world... I did not agree and I have not changed my mind, however only in countries of the third world the head of a ongoing criminal investigation is removed whereas he was not implicated by the investigation that he led. – There are always valid and legal elements... Finally. The only obstacle to the management of the investigation, almost political... are the senior leaders of the police forces. – My friend... People do not direct the police forces for personal interest... They lead in the pursuit of the public interest. This is the only way to understand the role of the police in a democratic State of law. -- But think for a while ! We can get to the point where only officers agreed by the arguidos will be in charge of some investigations... It could be a question of 'modernity ' . 2. Within the group, only the parents claim to have seen open the window in the missing child's bedroom ; most (travelling companions) cannot reliably testify on this point, as they ran towards the apartment only after Kate McCann launched the alarm. 6. There is a unlocated body, an ascertainment confirmed by the English EVR (Enhanced Victim Recovery) and CSI (Crime Scene Investigation) dogs and corroborated by laboratory's preliminary reports (pp. 219-220)." 26. On the launch day (24/07/2008), the book was also sold with the newspaper Correio da Manha. 27. 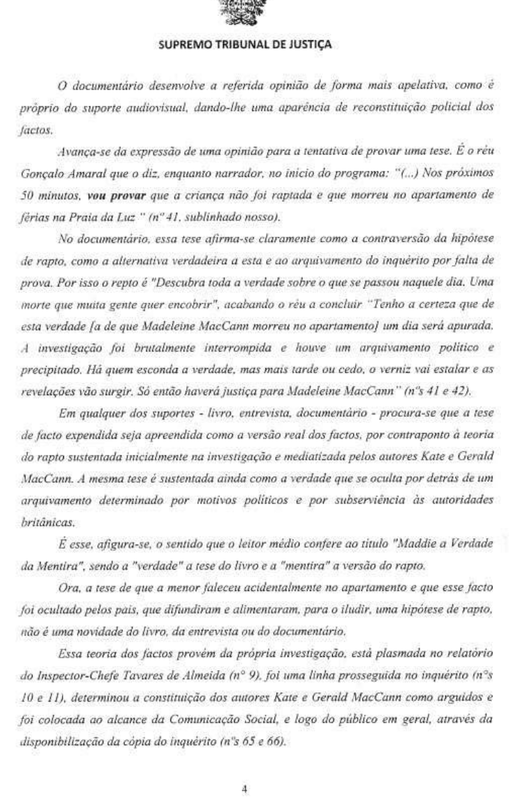 The book Maddie , the Truth of the Lie had the following editions in Portugal : 1st edition in July 2008, 30.000 printed copies ; 2nd in July 2008, 10.000 printed copies ; 3rd in July 2008, 10.000 printed copies ; 4th in July 2008, 30.000 printed copies ; 5th in August 2008, 25.000 printed copies ; 6th in August 2008, 10.000 printed copies ; 7th in August 2008, 15.000 printed copies ; 8th in August 2008, 10.000 printed copies ; 9th in August 2008, 10.000 printed copies ; 10th in August 08, 10.000 printed copies ; 11th in August 08, 10.000 printed copies ; 12th in 2008 10.000 printed copies. 31. 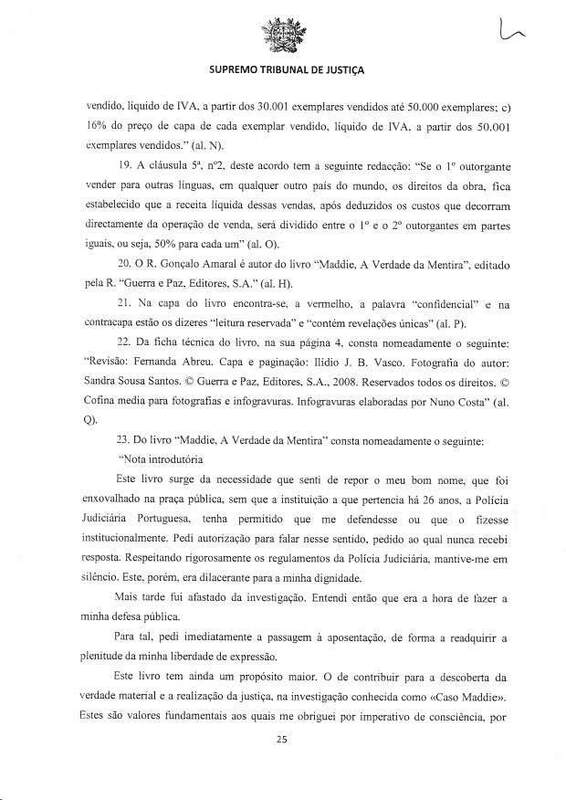 The cover price of the book "Maddie - A Verdade da Mentira" in Portugal was determined by the G&P defendant on the amount of 13.33 € VAT included (n° 2). 34. The defendant, VCFA is a commercial society that creates, develops, produces and promotes the exhibition and broadcast of cinematographic and audiovisual works. 35. 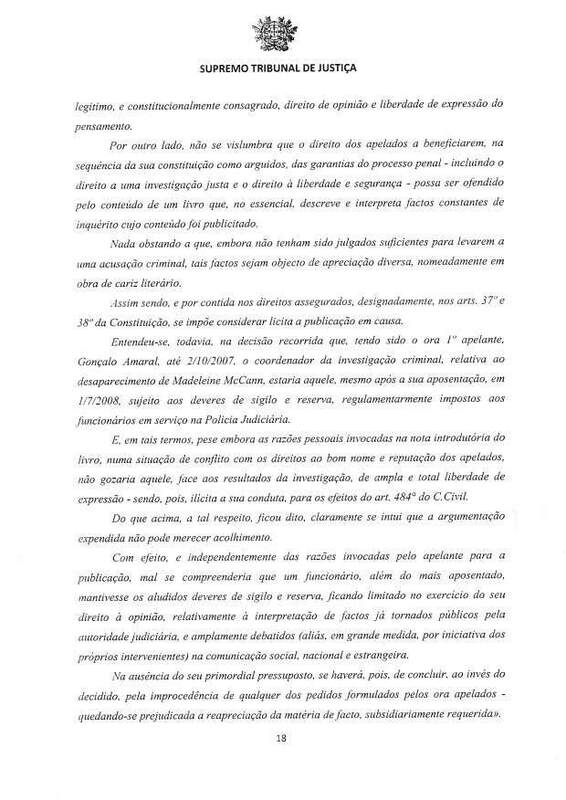 On the 7th March 2008, the defendant Gonçalo Amaral and the defendant VCFA signed a written agreement (pp. 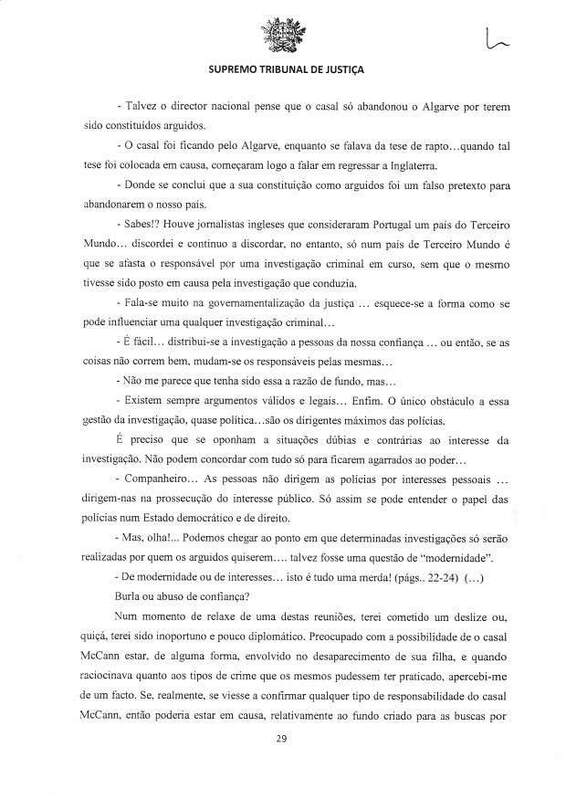 282-283) designated "option of rights – deal demo” through which the defendant GA gave up the exclusive rights of film adaptation (documentary and fiction) of a book about the investigation of the disappearance in Praia da Luz. 36. On the 11th March 2008, the defendant GA and the defendant VCFA signed a written agreement (pp. 284-288) , designated “transfer of rights – option contract” through which the defendant GA gave up to the defendant VCFA for 2 years the exclusive option rights to adapt the book into documentary and/or fiction that may have the format of a film for cinema or a TV movie. 37. Clause 2 of this agreement states the following : By the transfer of these exclusive right of option, VCFA compromises to pay the author the gross sum of 25.000, subject to legal fees and added VAT. … the patrimonial content of author rights to VCFA the author will receive the gross sum of 15.000 euros, subject to legal fees. 3) For the transfer of rights mentioned in 2) the author will receive 10% of all receipts national or international receipts for the trading of the documentary (in all platforms and supports invented or yet to be invented) after deduction of production costs. 40. 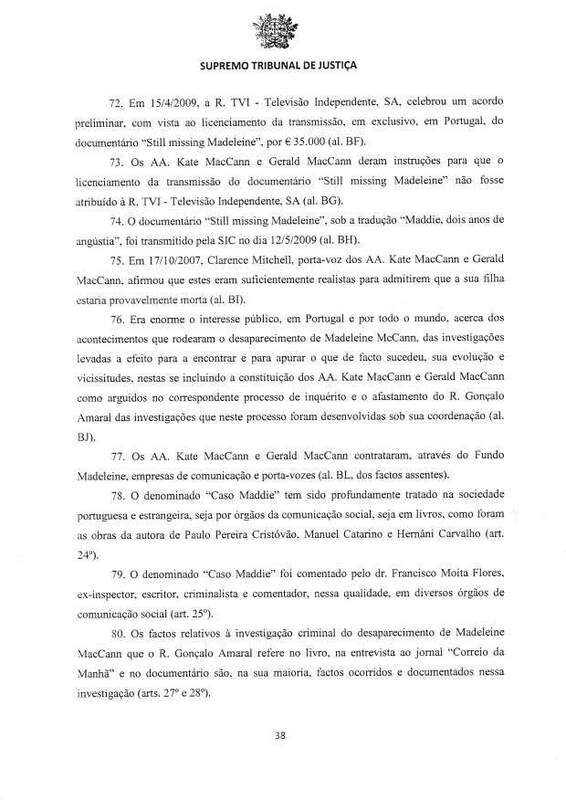 The defendant VCFA produced the documentary Maddie, The Truth of the Lie, directed by Carlos Coelho da Silva, which is an adaptation of the book written by the defendant GA. This documentary, in DVD format, is appended to the files. 45. On April 13, 2009 and May 12, 2009 the documentary was broadcast by the defendent TVI. 47. At least two million and two hundred thousand people watched the program broadcast by TVI on 13.04.2009. (n° 10). 50. 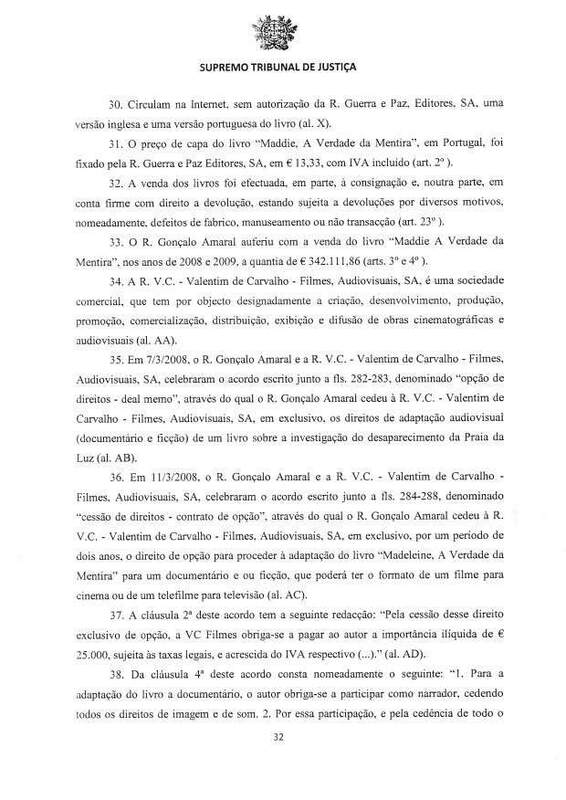 The defendant Gonçalo Amaral gave interviews to the defendant TVI on the 16.05. and the 27.05.2009. 51. By the end of April 2009, the documentary went on sale on DVD with the title "Madeleine - the Truth of The Lie” - A Powerful Documentary based on the best seller “Maddie - A Verdade da Mentira” by Gonçalo Amaral. 68. The claimants KMC and GMC gave an interview to the North-American TV program Oprah hosted by Oprah Winfrey, revealing the existence of new witnesses, reconstructions 1 and e-fits. 70. This interview for the Oprah program was broadcast in Portugal by SIC, on the 9.05 and 12.05.2009. 71. The claimants KMC and GMC, in collaboration with the British television station Channel 4, made a documentary about the disappearance of their daughter, entitled Still missing Madeleine, lasting 60'. 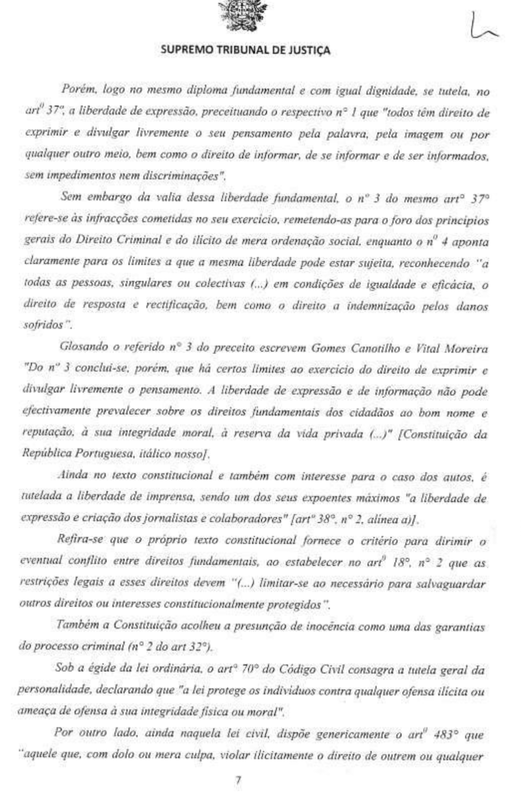 1 : "Reconstituições", in the original document, is here translated "reconstructions", since this is what is meant. In Inquisitorial Justice Systems a reconstitution aims to recreate an event with the proper protagonists, in an attempt for the police forces to understand what happened. It is quite different in Adversary Justice Systems where a reconstruction is the re-enacting of an event with actors and in front of cameras in order to jog the memory of the public. 72. 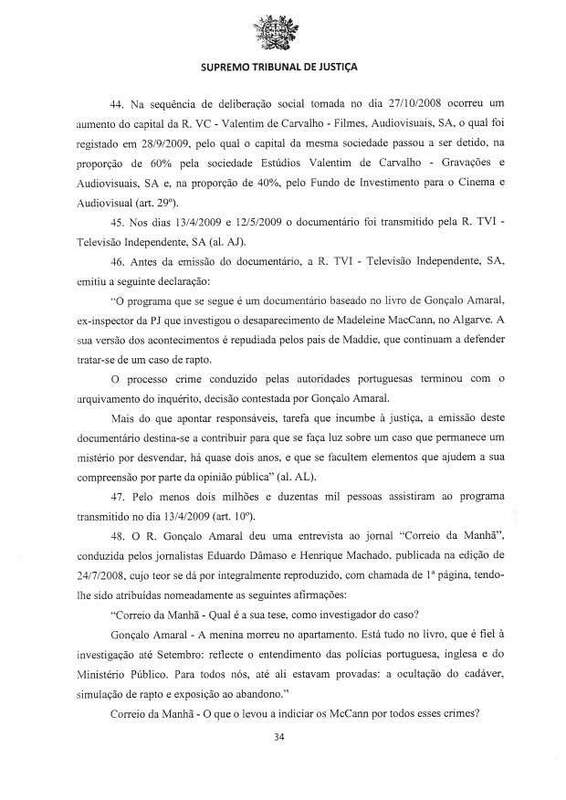 On 15.04.2009, the defendant TVI signed a license preliminary agreement for broadcasting, exclusively in Portugal, the documentary SMM for 35,000 €. 73. 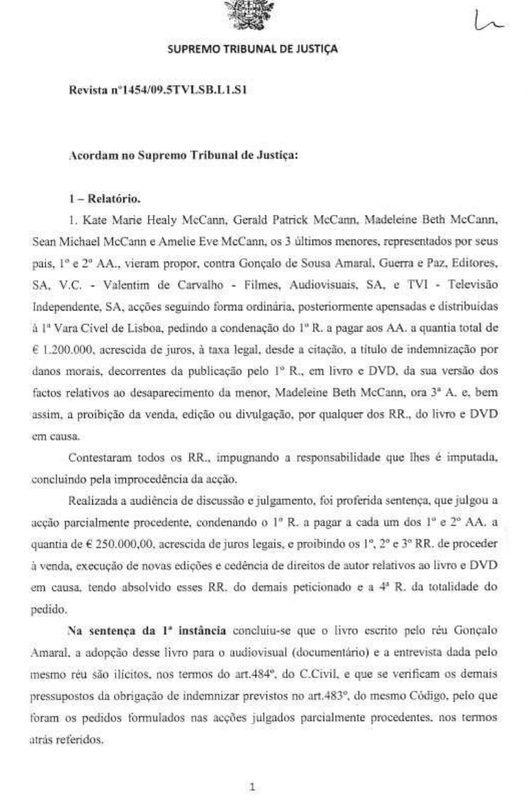 The claimants Kate and Gerald McCann asked that the license for broadcasting the documentary SMM would not be attributed to the defendant TVI. 80. 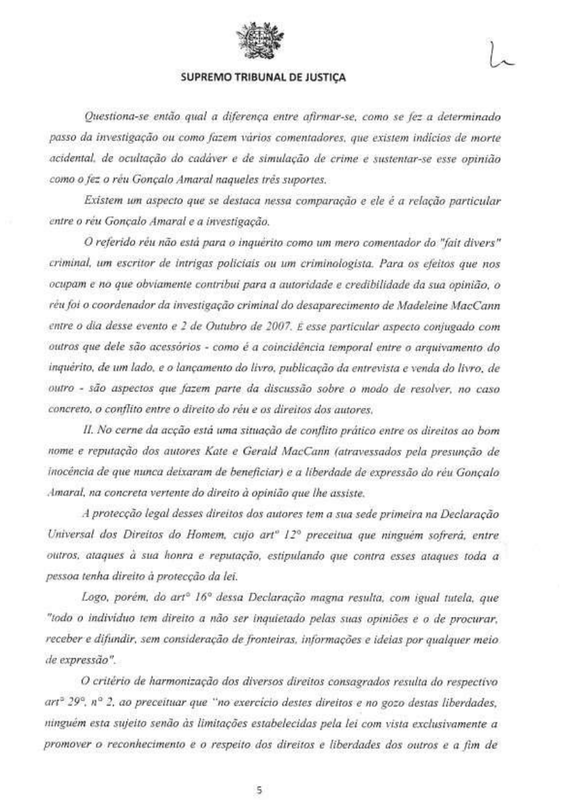 The facts related to the criminal investigation of Madeleine McCann's disappearance that the defendant Gonçalo Amaral refers to in the book, in an interview with the newspaper CdM and in the documentary are mostly facts that occurred and are documented in this investigation. (n° 27 and 28). 1 : Those n° refer to the inquiry data basis.